There are two opposite errors that evangelical Christians easily stumble into on the topic of baptism: we treat it with too little or too much importance. The former error, I assume, is more common these days. The thinking here is, the West is secularizing; we live in post-Christendom now; let’s not divide over non-essentials. Instead we must affirm the main thing we all share—the gospel. The solution to the first error is to recognize that baptism may not be essential, but it is important. The solution to the second is to realize that baptism is important, but not essential. In short, Christians need at least three categories for setting theological priorities: essential, important, and unimportant. We often miss that middle category, and act as if everything is either essential or completely unimportant. Baptism is not essential because it does not save. The word of the gospel alone saves. Yet baptism is important because (i) it proclaims the gospel visibly; (ii) it helps to protect the gospel from generation to generation; (iii) and it serves to publicly identify the people of heaven on earth, both for their sake and for the sake of the nations. Admittedly, I am not an objective reader. 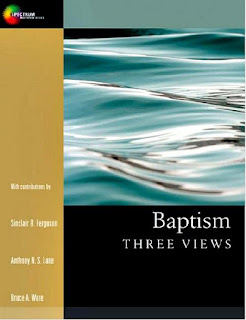 I was convinced of...believers’ baptism [before] picking up the book, and I remain convinced of it setting it down, maybe even more so.